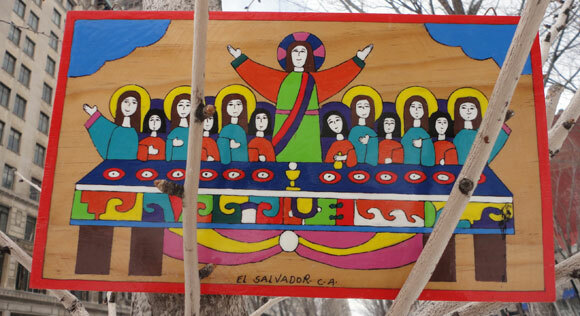 I picked up this piece of art in El Salvador. I love the bright colors and the image of Jesus with his disciples. Sometimes you end up in situations where someone is a bit challenging. I’m not talking about, say, dating someone who is abusive. In that case you get out and you get out fast, OK? I’m talking about a study group or a workplace or a classroom setting…something where you’re thrown in with a group of people and you don’t really have the option to run. What happens when you’re there and someone is troublesome? I don’t actually have answers. It’s just, I’ve been working through something like this and have a few quotes and thoughts to share. From this I gather: we don’t always get to hang out with the healthy people. We must also interact with the wounded…and these need us, too. Maybe that challenging person needs to be reminded what compassion and mercy look like, and you must be the one to remind them. (“We’re the best the Church has got!” ~From my New Year’s retreat). 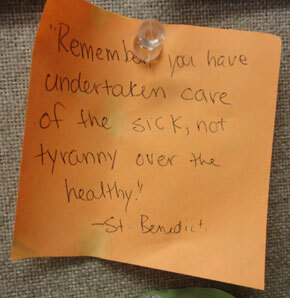 Worn post-it note reminding me of St. Benedict’s words. This is a beautiful reminder of the fragility of the human person. Also attributed to other people but, dang, words of wisdom. So important to remember. But so hard, too. Real talk, especially when you’re the one being hurt. This takes that last quote and builds on it. Someone else might be in an intense spiritual battle, but how much better would it be if, like Simon of Cyrene, we were able to help them? They’re heady thoughts, I know. I was thinking about this yesterday at mass. It was right before we were all going to go up and receive communion. Jesus. Coming to earth, breaking bread, dying on the cross…just wants to be WITH us. I realize, as I type this, that that’s the base of all of these quotes, isn’t it? We’re broken and wounded and imperfect, too. And so, Jesus is WITH us. Just so that we know we’re not alone.